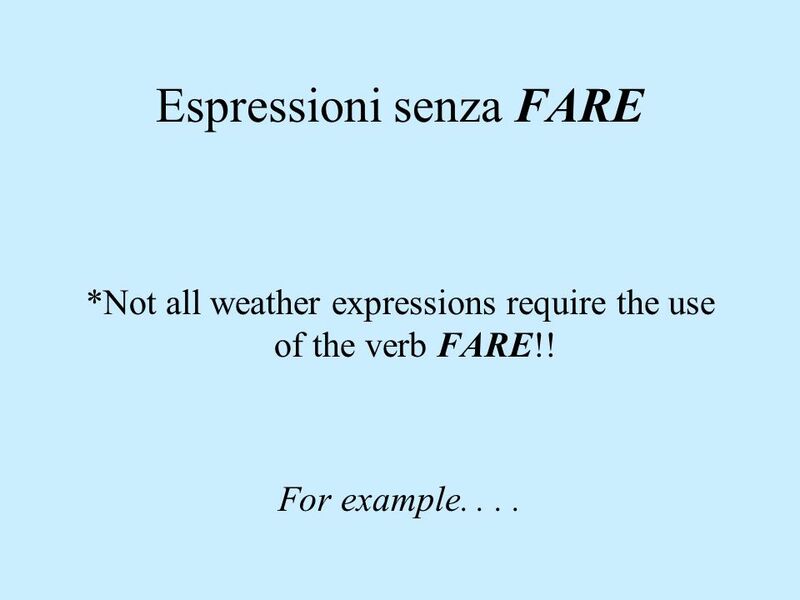 *There is a certain set of weather expressions which only use the 3rd person singular form of FARE. 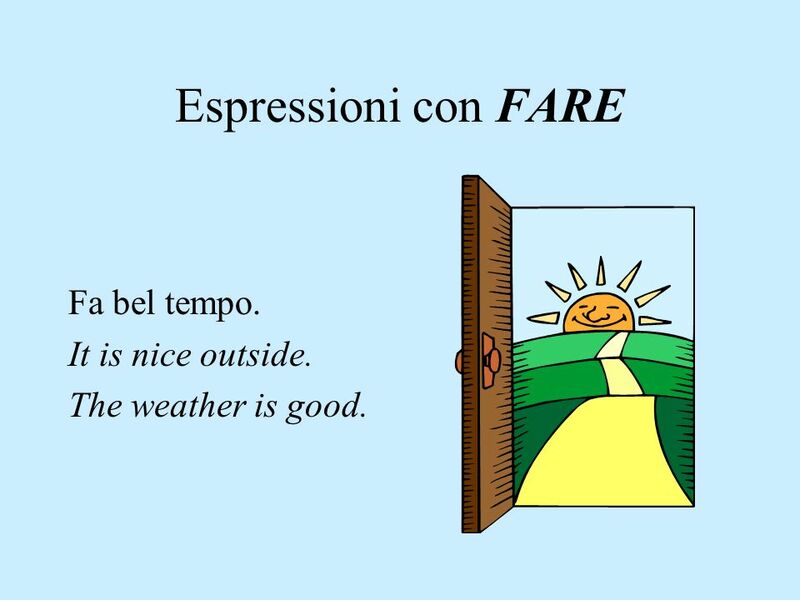 Che tempo fa oggi? How is the weather today? What’s the weather like today? 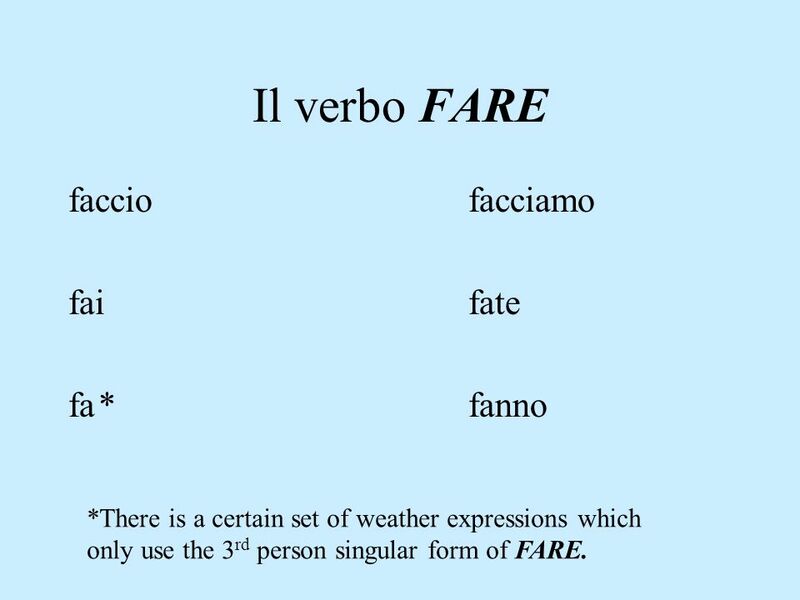 4 Espressioni con FARE Fa bel tempo. It is nice outside. 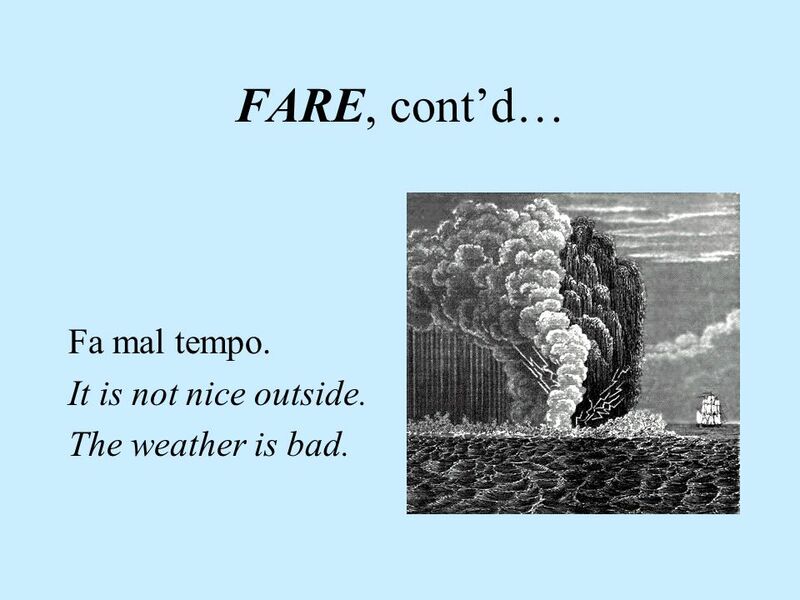 5 FARE, cont’d… Fa mal tempo. It is not nice outside. 6 FARE. . . Fa caldo. It is hot outside. The weather is hot. 7 FARE. . . Fa freddo. It is cold outside. The weather is cold. 8 FARE. 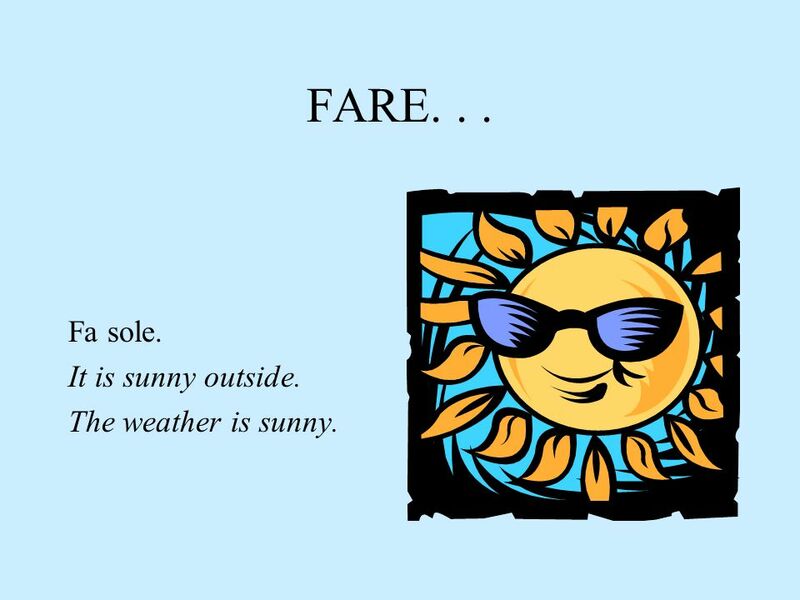 . . Fa sole. It is sunny outside. The weather is sunny. 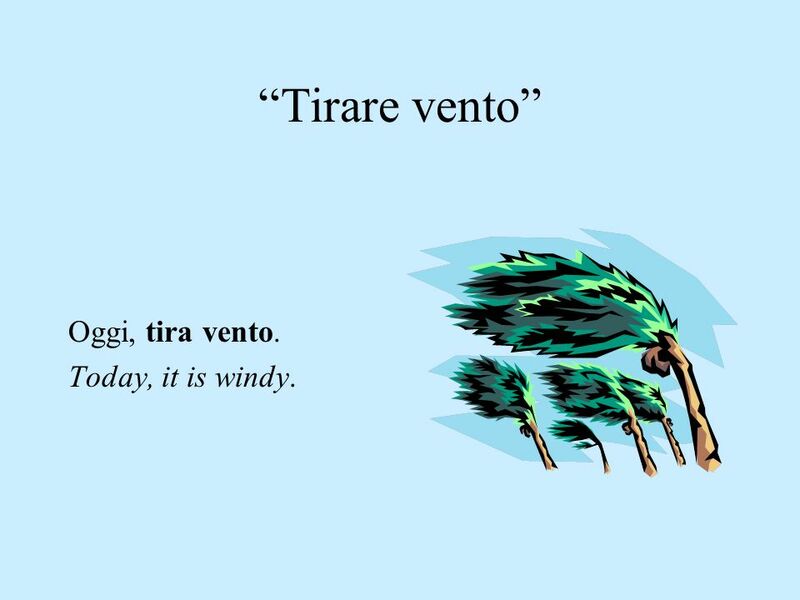 10 “Tirare vento” Oggi, tira vento. Today, it is windy. 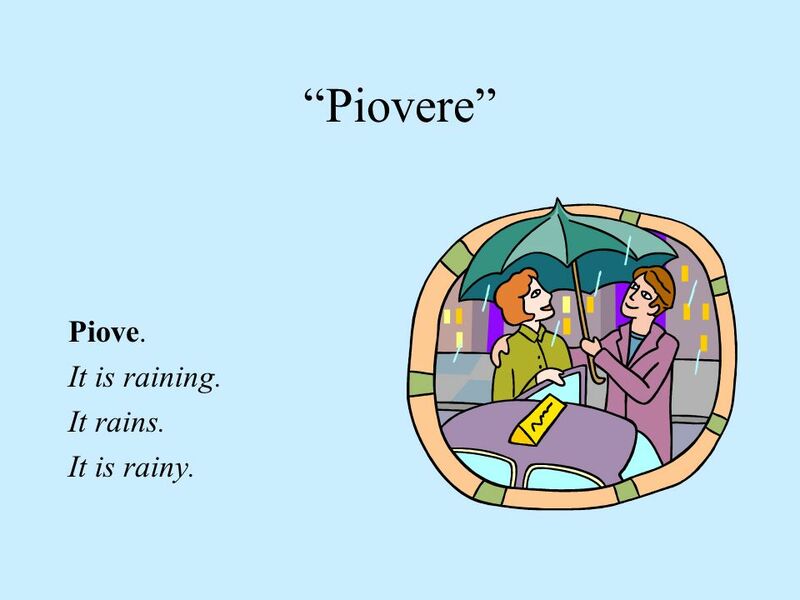 11 “Piovere” Piove. It is raining. It rains. It is rainy. 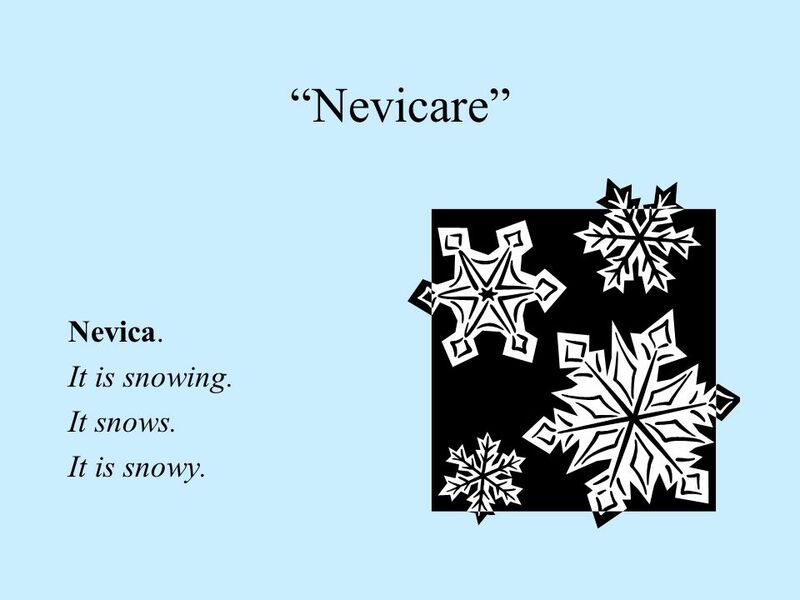 12 “Nevicare” Nevica. It is snowing. It snows. It is snowy. It is storming. There is a storm. It is stormy. Lampeggia. It is thundering. There is a thunder storm. 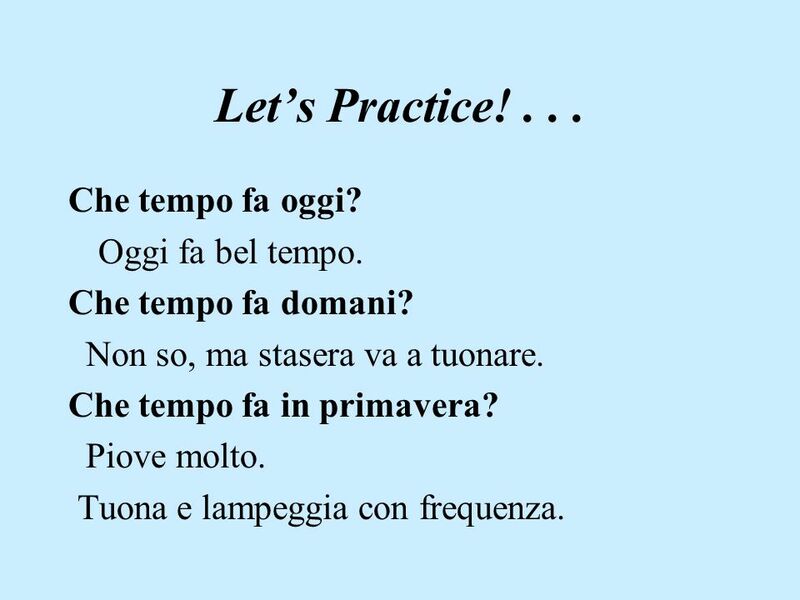 14 Let’s Practice! . 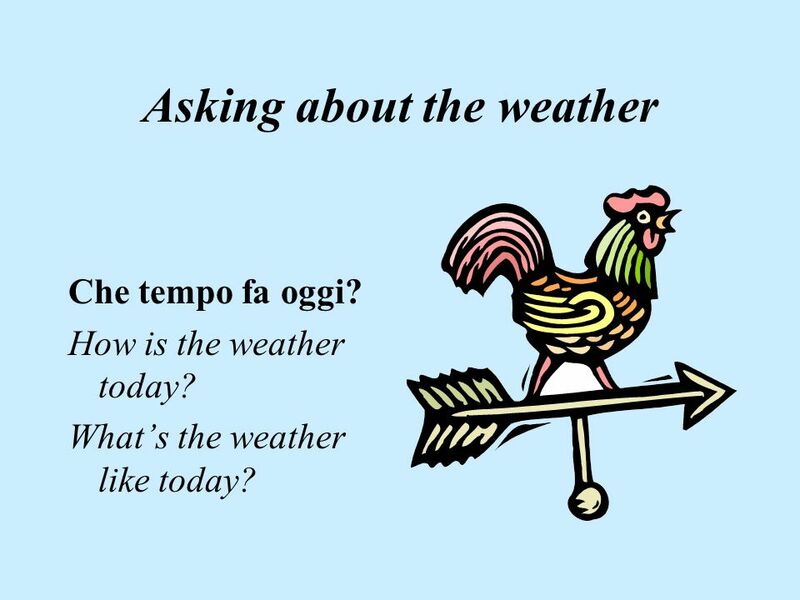 . . Che tempo fa oggi? Oggi fa bel tempo. Che tempo fa domani? Non so, ma stasera va a tuonare. Che tempo fa in primavera? Piove molto. Tuona e lampeggia con frequenza. 15 More practice . 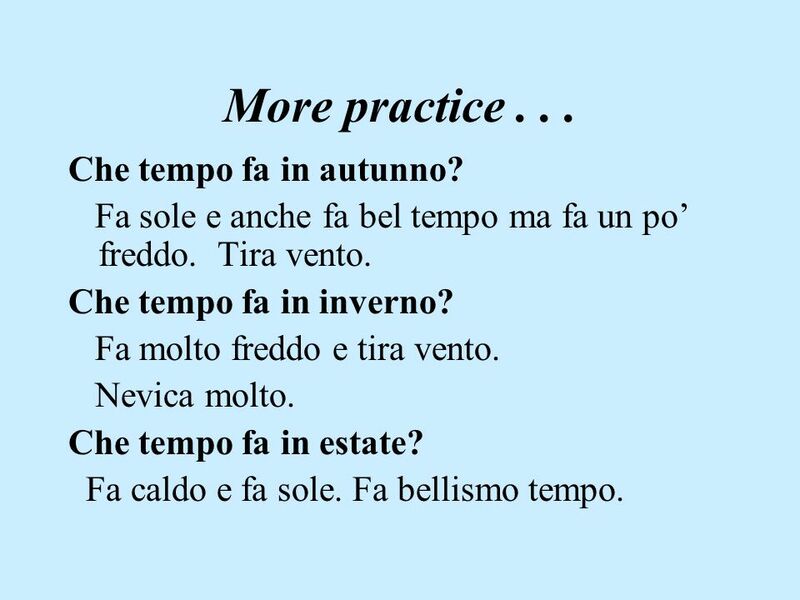 . . Che tempo fa in autunno? Fa sole e anche fa bel tempo ma fa un po’ freddo. Tira vento. Che tempo fa in inverno? 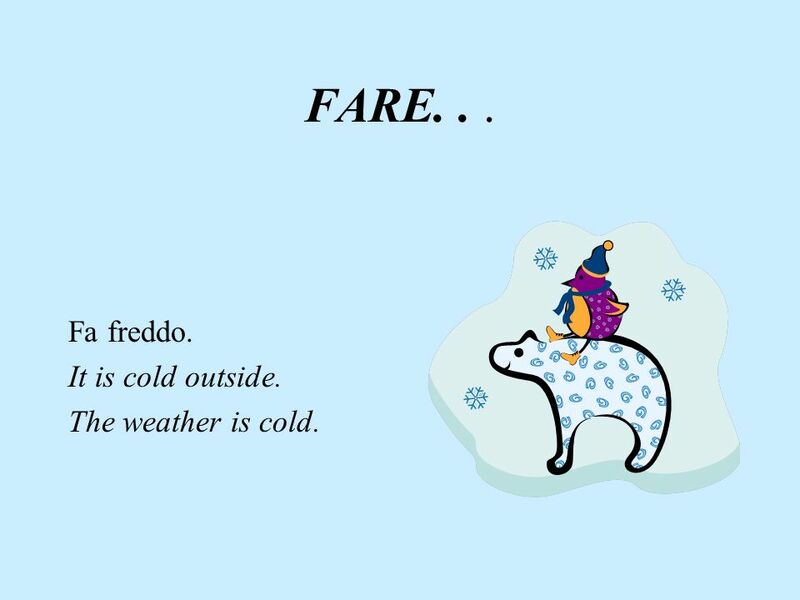 Fa molto freddo e tira vento. Nevica molto. Che tempo fa in estate? 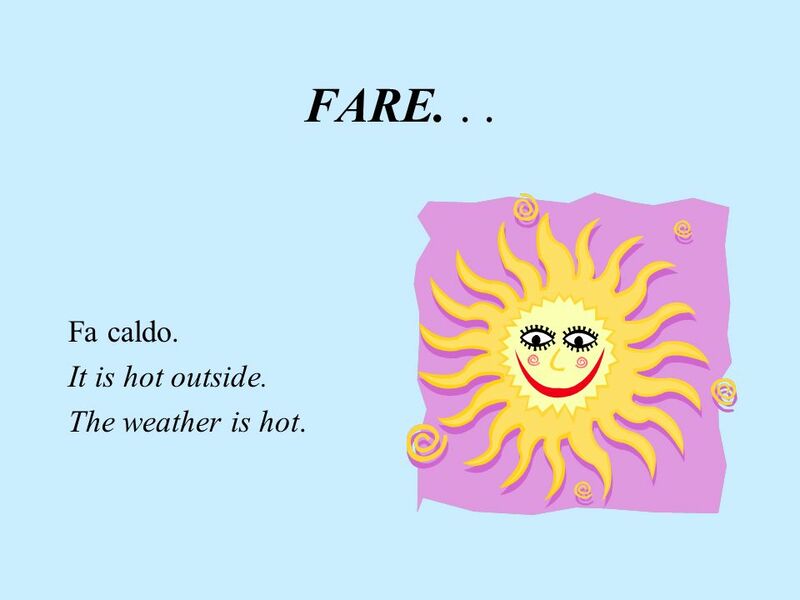 Fa caldo e fa sole. 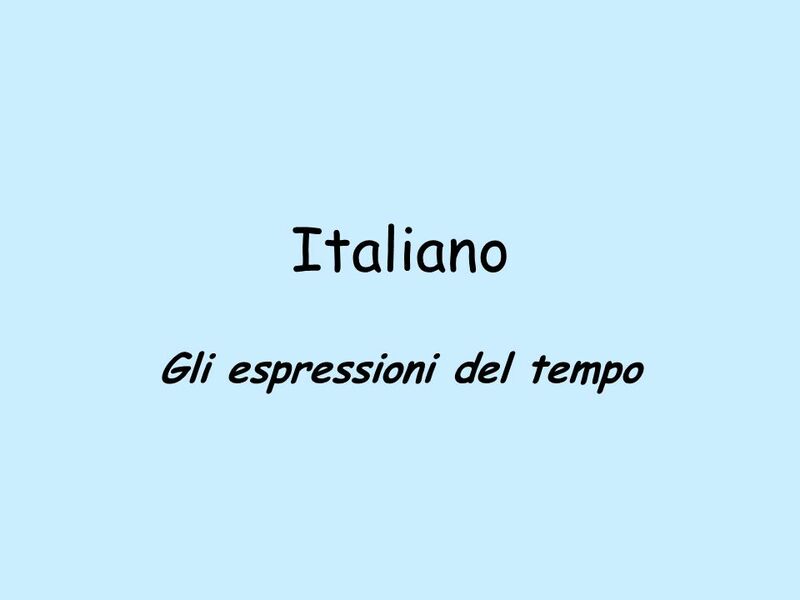 Fa bellismo tempo. 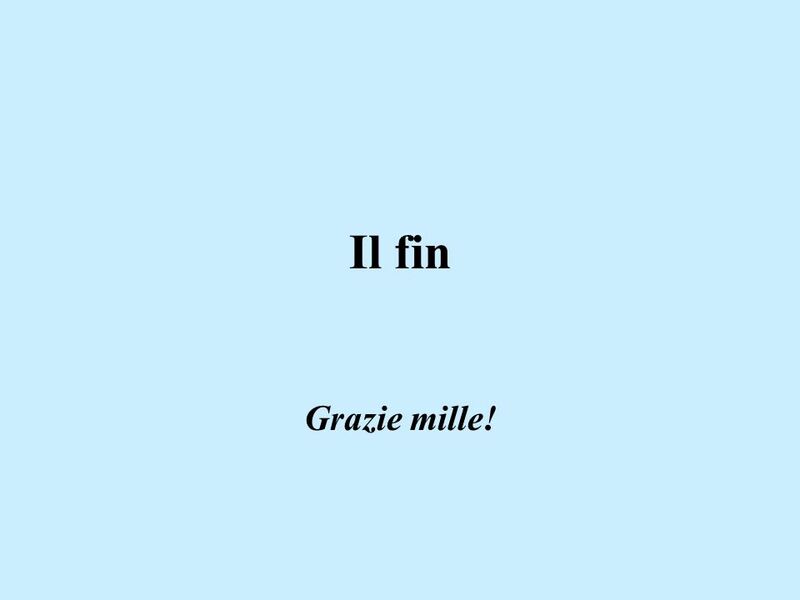 16 Il fin Grazie mille! 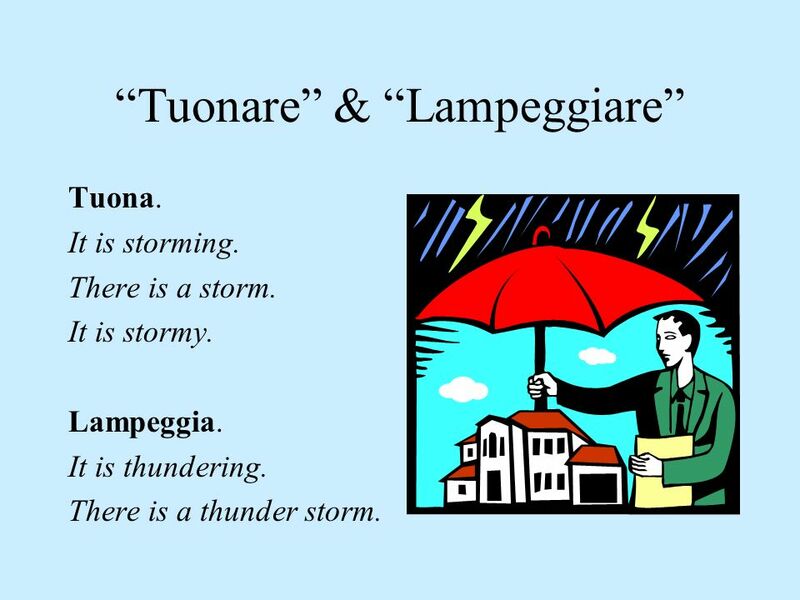 Scaricare ppt "Gli espressioni del tempo"
IL Condizionale Capitolo 14 Turn to pagina 300 in your textbook.